Ball Collection Elite Brushed Silver Wide Mouth Lids and Bands complement any Ball Wide Mouth Glass Preserving Jar. Seal in the freshness with a contemporary brushed silver finish. 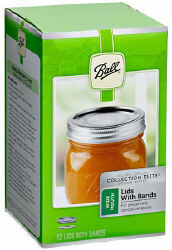 Perfect for serving, storing and preserving with Ball Collection Elite Jars.